The paper presents the opus “Solitude in Imprisonment. With Proper Profitable Labour and a Spare Diet, the Most Humane and Effectual Means of Bringing Malefactors, who Have Forfeited Their Lives, Or are Subject to Transportation, to a Right Sense of Their Condition; with Proposals for Salutary Prevention” (1775), by English philanthropist, traveler and publicist Jonas Hanway, that is unknown in Russian historiography. Based on methodological principles of the ‘new cultural and intellectual history’, the author analyzes the discourse of the problem, which makes it possible to examine the overdue reform of the English penal system comprehensively and to identify its reflection in the public consciousness. The English enlightener discusses the causes of the increasing criminalization of society and comes to the conclusion that the main problem lies in ‘infidelity and neglect of religion’ and ‘disobedience of the laws of our country’ as a result. As a way to ‘cure moral disease’, Hanway offers a radical reform of the penal system. He disapproves the methods of criminal repression (death penalty, transportation overseas), because that does not solve the problem of increasing criminalization and does not introduce good morals and support religion. Jonas Hanway presents his social project of the perfected prison (he calls it ‘the reformatory’), based on the principles of solitary confinement, religious authority and correctional labor. The enlightener introduces the concept of ‘the intermediate state between both worlds’, and represents solitary confinement as a location and a condition for deep reflection and desire to make amends and to render life useful and beneficial to society. The theoretical and methodological basis for Hanway’s penitentiary project is in the ideals of the Enlightenment and Christian ethics, which is supposed to prepare offenders and criminals to achieve harmony in both worlds. Hanway draws the attention of authorities and society to the danger of further marginalization of the inhabitants of the metropolis. In conditions of practical absence of the police, he appeals to morality and religion as the only way to ‘preserve the people, in the enjoyment of the genuine fruits of liberty and freedom from violence’. In the essay, Hanway reflects on the progressive idea to revise the purpose and goals of the prisoners’ work: from punitive and convict labor to correctional labor leading to honest life. The author of the paper comes to the conclusion that the particular spiritual development of English society at the turn of the Middle Ages and modern times, as well as the religious quest of English Protestantism, led to the direct dependence of the penal reform on the religious factor. 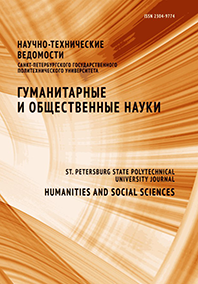 The paper aims to develop the paradigm of the ‘new cultural and intellectual history’ in modern national historical science.